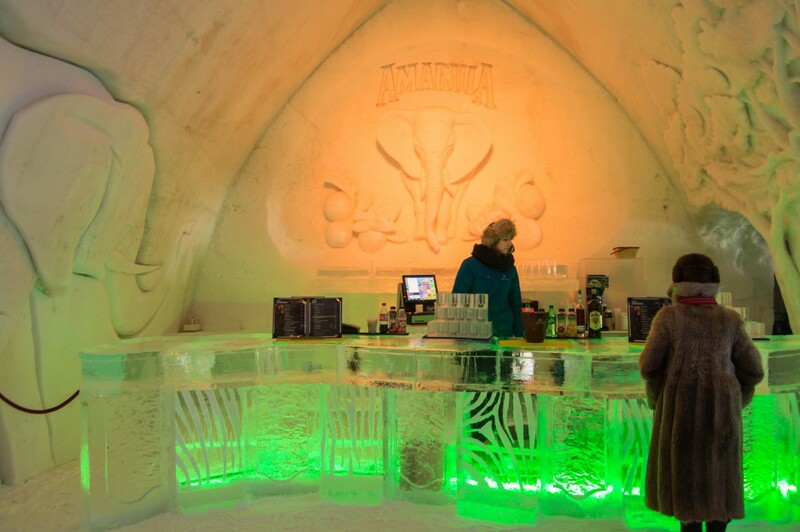 When I am told I can have a cocktail served in a glass made of ice in a bar built of ice inside a hotel constructed of ice, I am not going to miss out on this opportunity! Not surprisingly, even the name of my drink was ice cider. 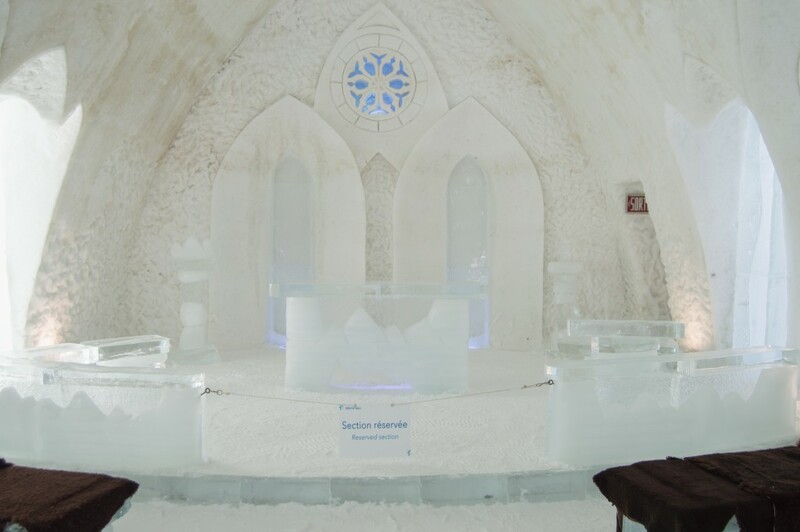 Hotel de Glace is a hotel made of ice and snow and located in Quebec City, Canada. 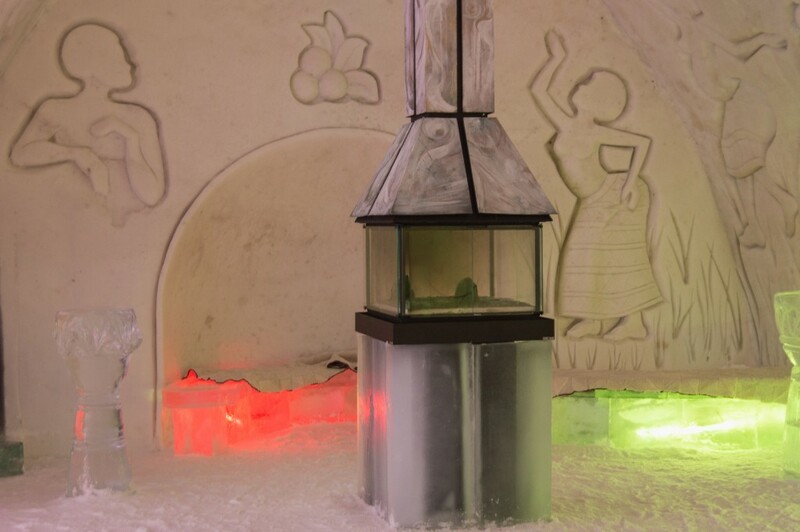 The hotel is seasonal and open from January 4th to March 28th this year. 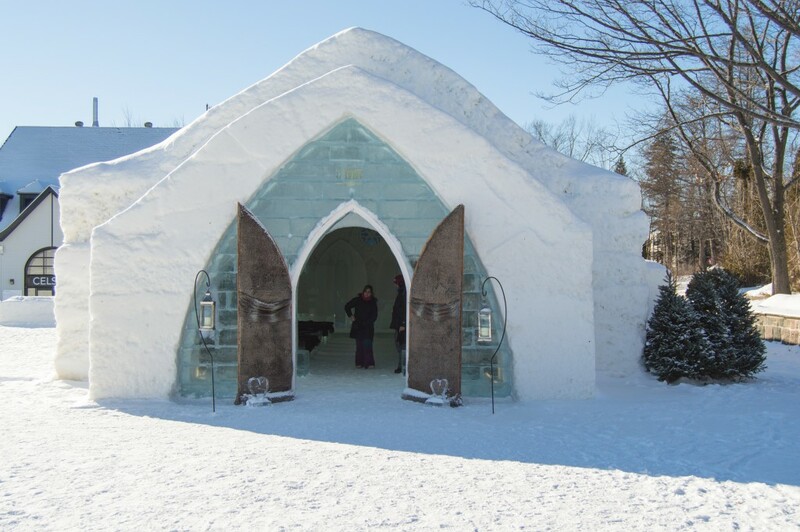 The first such hotel in Quebec was inspired by Swedish traditions and built in 2001. 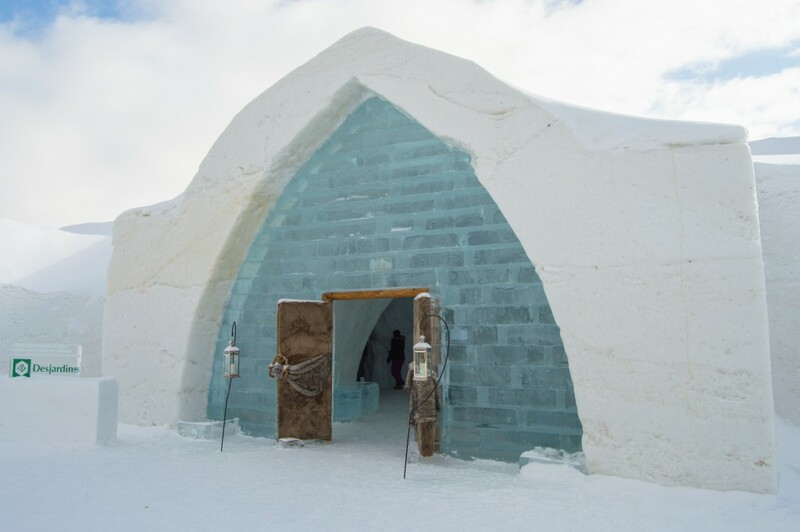 Snow and ice for building the hotel are man made since natural snow is not dense enough. Besides, relying on Mother Nature doesn’t pay off. This year construction had to be delayed because of unusually warm weather in November. 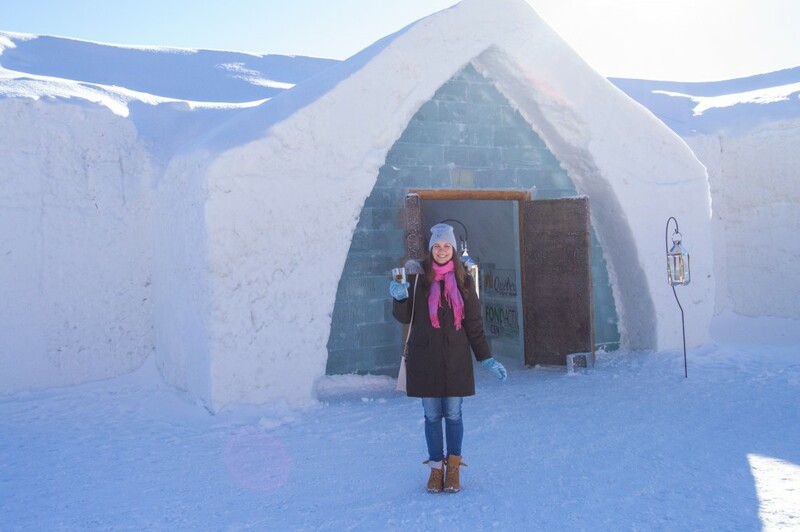 Construction can only start when temperature goes down to -5°C (22°F). For the same reason snow and ice could not be produced in Quebec but had to be made 15 km up north and brought to the site in trucks. The hotel was built within just 4 weeks this year. 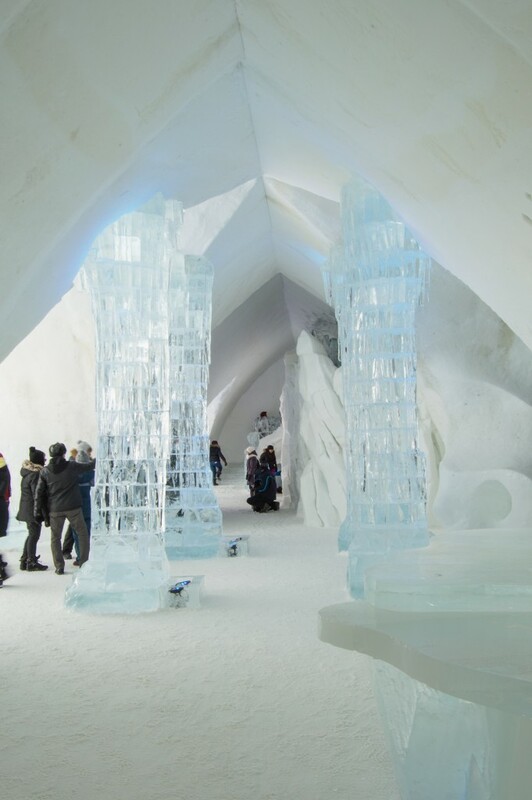 It takes about 25 000 tons of snow to build all the structures. 10 000 tons are used for floors and 15 000 for walls and ceiling. 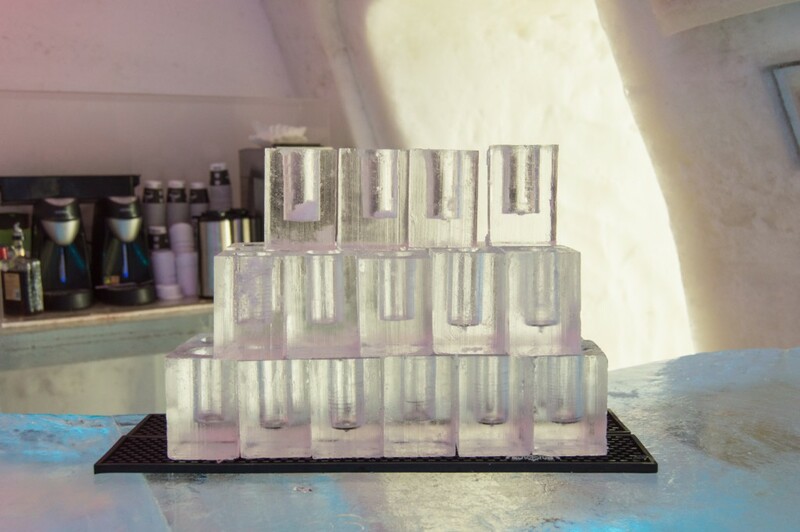 Three different types of ice are used in construction: ice that has been treated so that oxygen and minerals are removed – this type of ice is clear and transparent, ice with added oxygen that has bubbles inside, and white colored ice that was made by adding milk to water. 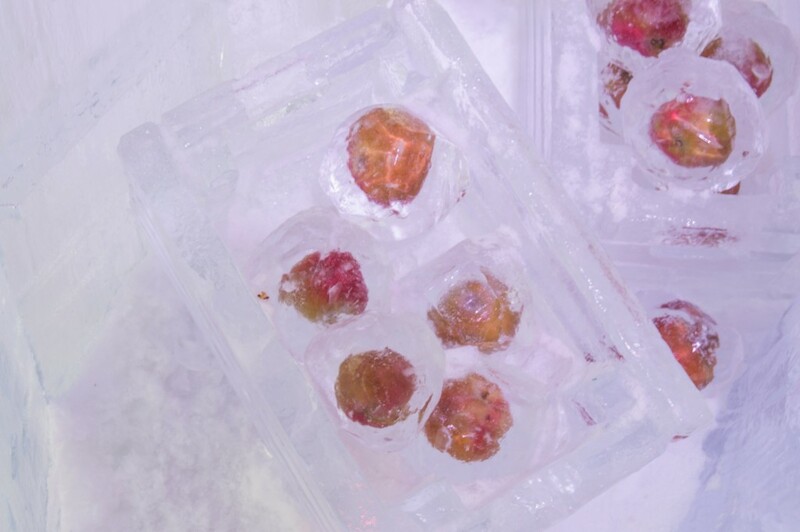 Since all ice is produced on a food factory it is perfectly edible. So you can go ahead and lick a wall or a column. Your tongue is not going to get stuck either because the temperature inside is not low enough – it is always -5°C (22°F). Today the hotel features 44 suites and rooms. 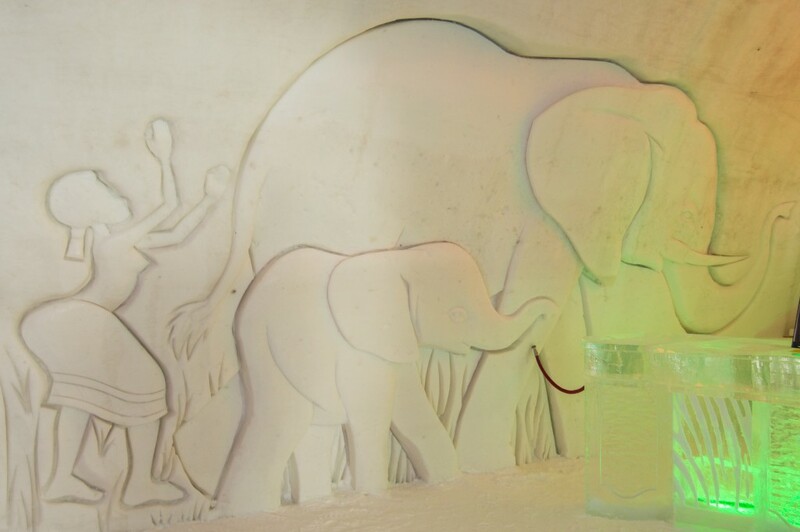 All suites are decorated in a unique way, while all the rooms are very simple and similar to each other. 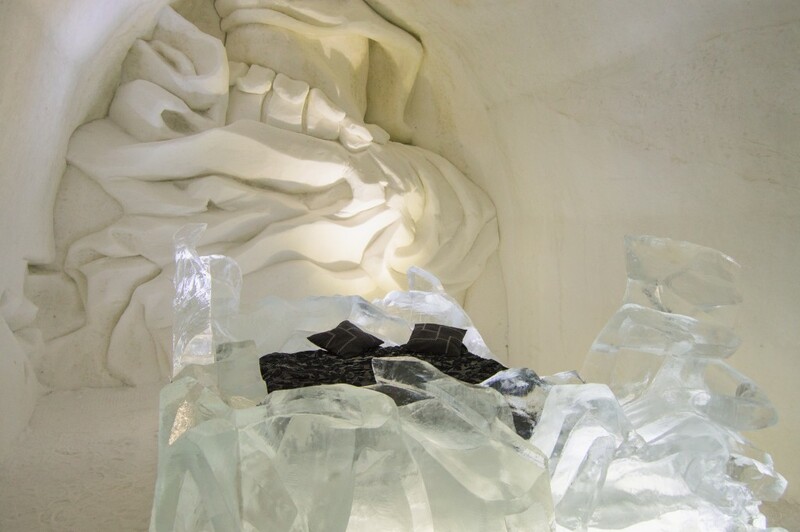 Three of the suites were designed by students of Quebec universities who enrolled in a competition. These are examples of customized suites. And this is how standard rooms look like. Staying overnight is possible and our guide mentioned several times that everybody, who had the courage to sleep here, survived. 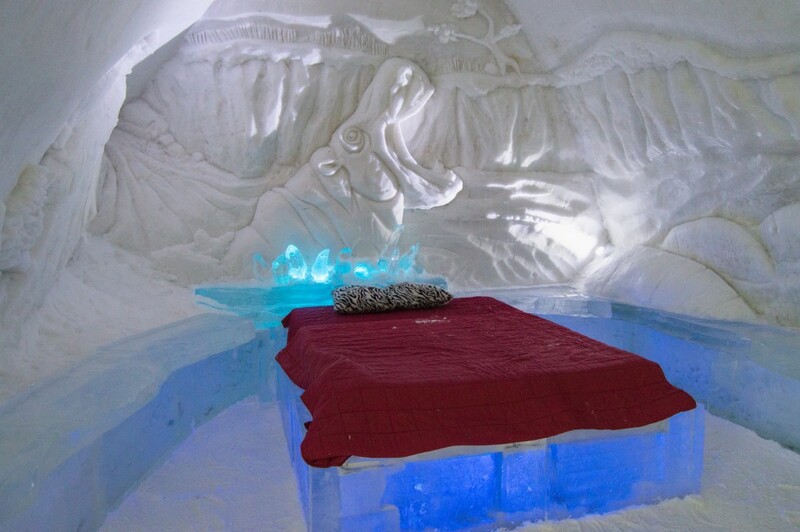 In fact you are not sleeping directly on ice, there is a layer of insulation between ice and mattress and every client is given a sleeping bag designed for winter camping. So you are perfectly warm and cozy. Until you realize you want to pee. In that case you have to run in your sleeping bag to a restroom in the main building which will take about 5 minutes up and down. 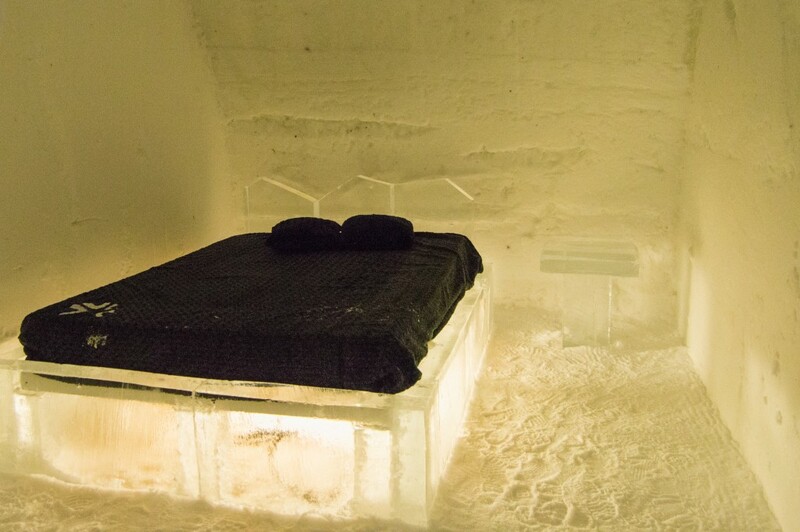 If you want to know what it’s like to stay in an ice hotel overnight from a person who did it, check out this post. Apart from this little detail nothing will ruin your perfect night. The walls are so thick there is no light coming in and no sound, too. There are even fireplaces built in most of the suites. 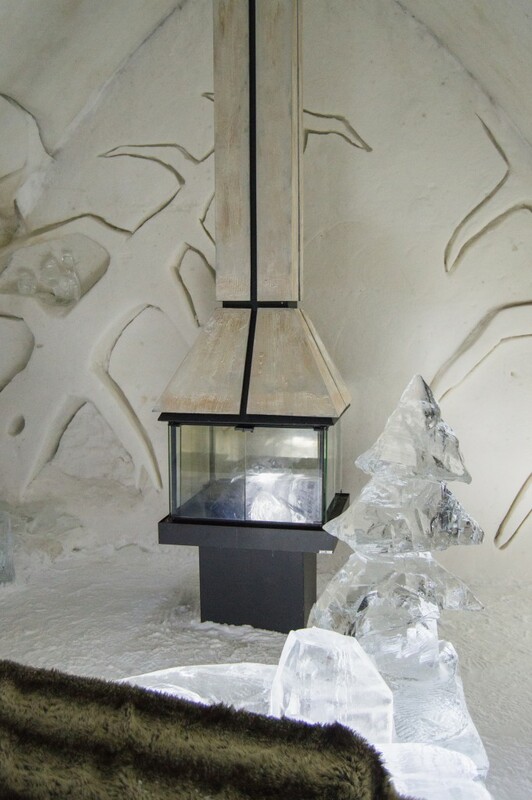 But it turned out, the heat is contained inside an insulated box – the fireplace is somewhat of a placebo. 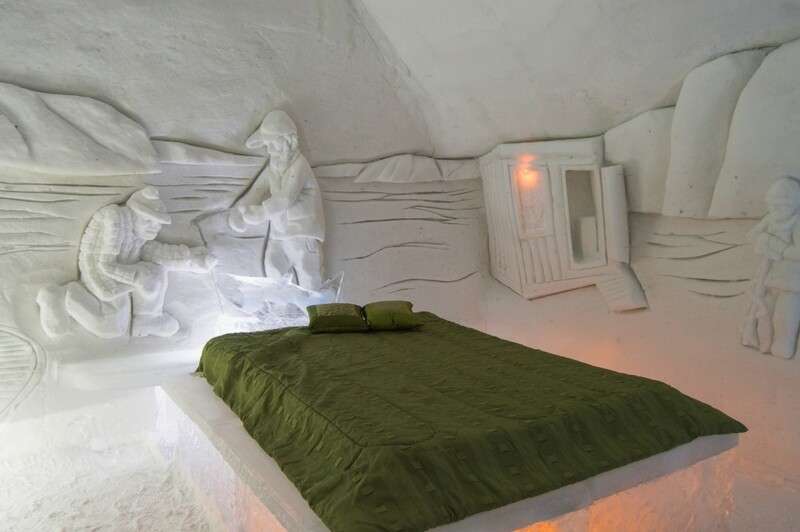 People might feel warmer just by looking at it while all the heat and smoke come out through a chimney in the ceiling. A little chapel on the premises is used for weddings, proposals and renewal of vows. Only for this season over 40 wedding are planned for this venue. Now let’s head down to my favorite part of the hotel – to the bar! There’s not one, not two, but three bars in the hotel! 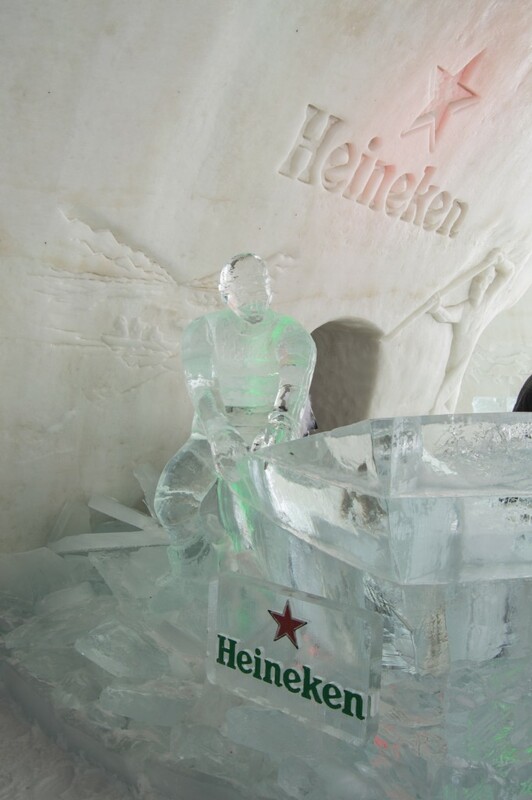 And, obviously, they, too, are made of ice. 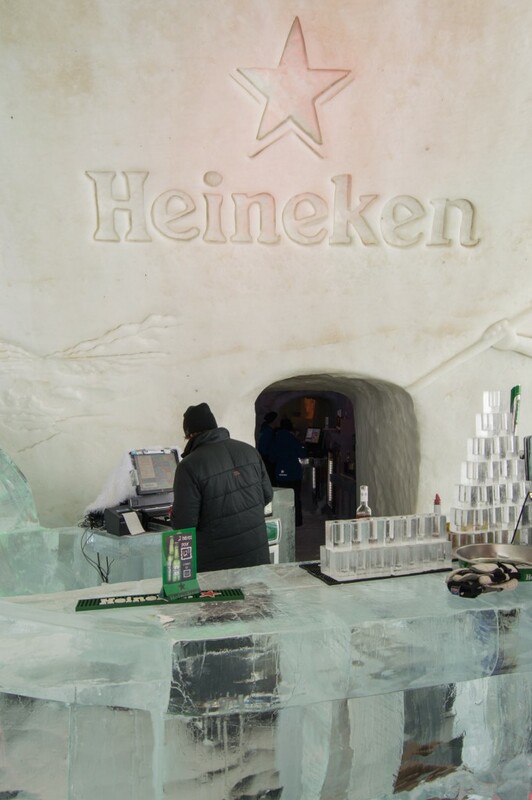 The first bar serves Heineken beer. 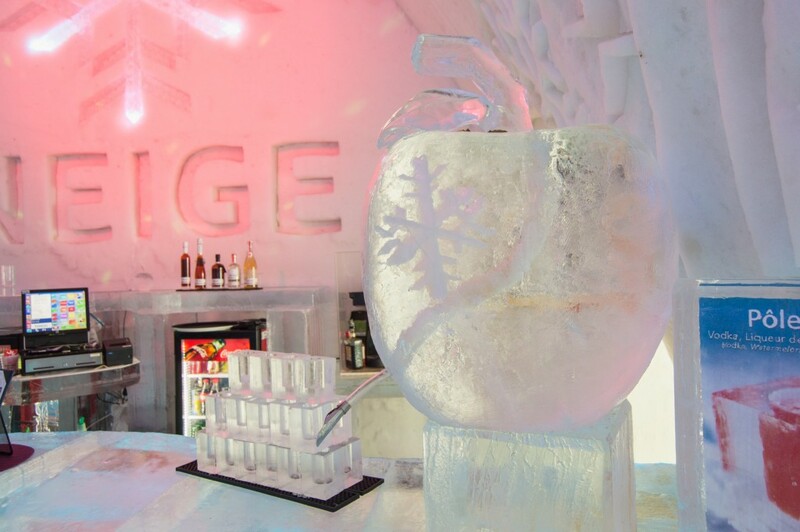 The second bar focuses on drinks made with Neige, québécois ice cider. And the third one serves Amarula, a cream liquor from South Africa. 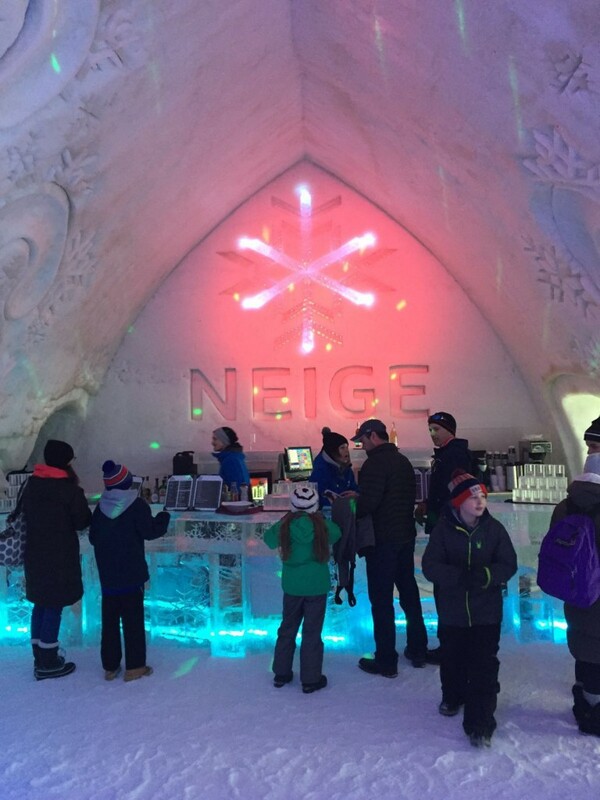 I am all for local products and traditional Canadian experience, so Neige bar it is. The cider is sweet and crisp and has 12,5% of alcohol. 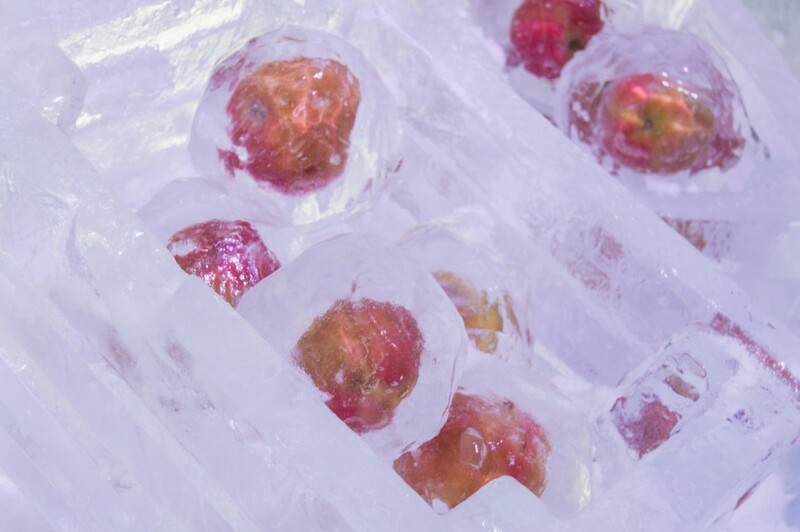 Blend of handpicked apples – McIntosh, Cortland & Spartan – are used for its production. It is perfect as an aperitif or in cocktails. 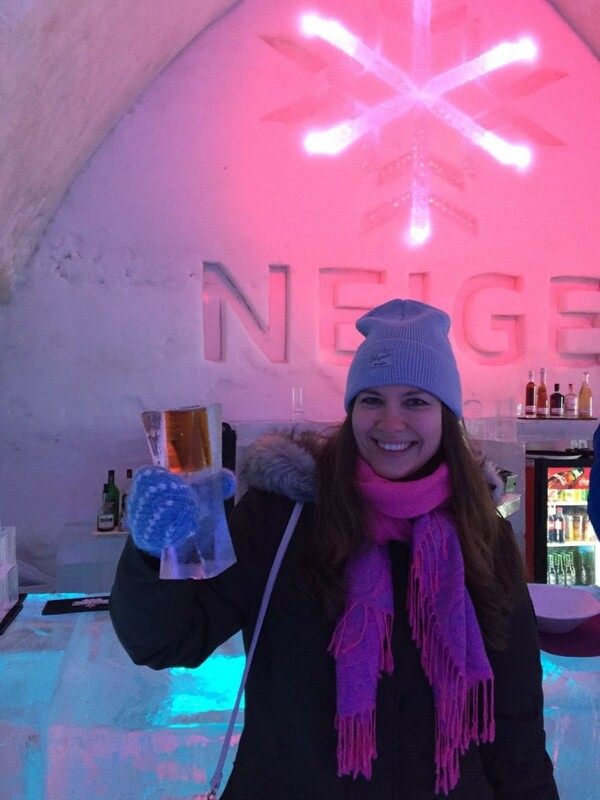 I chose Pomme Givrée à l’érable – a cocktail made of Neige cider and maple reduce. 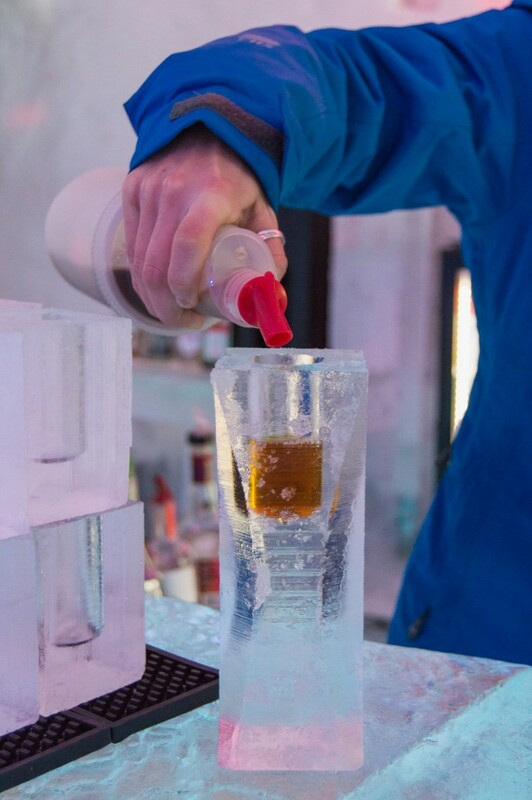 Like apple cider is not sweet enough – I just had to add some maple! I don’t have a sweet tooth, I have 32 of them – absolutely describes me. The bartender explained that maple reduce is thicker than maple water but not yet maple syrup. 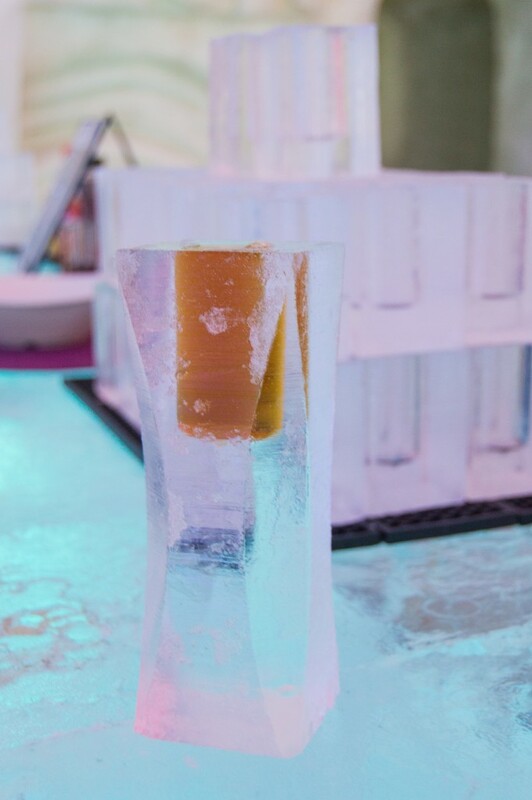 All drinks are served in ice glasses and about 45 000 of these are used in one season. My cocktail was served in a taller glass called flute. To be honest, I didn’t expect it to be the best cocktail of my life or even a good cocktail for that matter. Having this drink was experience in itself. How happy I was to realize I was wrong. This cocktail was delicious! Sweet and crisp just as the description promised. If you are into all things sweet as I am, you will love it, too. 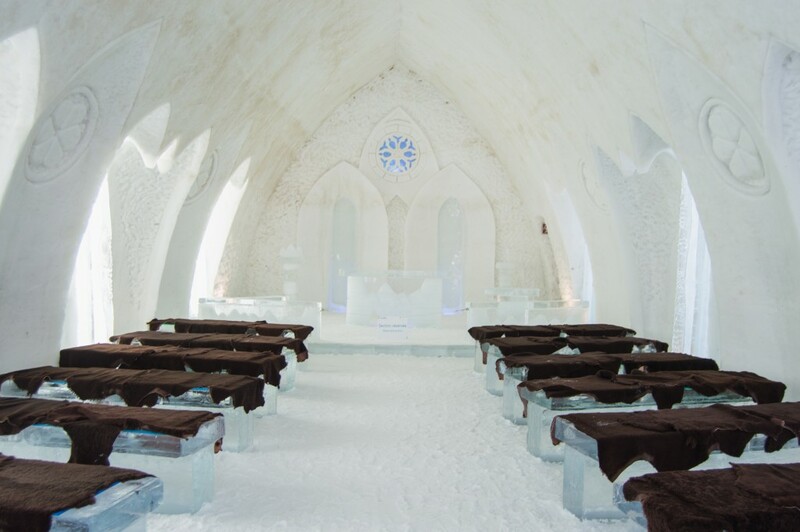 Hôtel de Glace is definitely a bucket list destination. 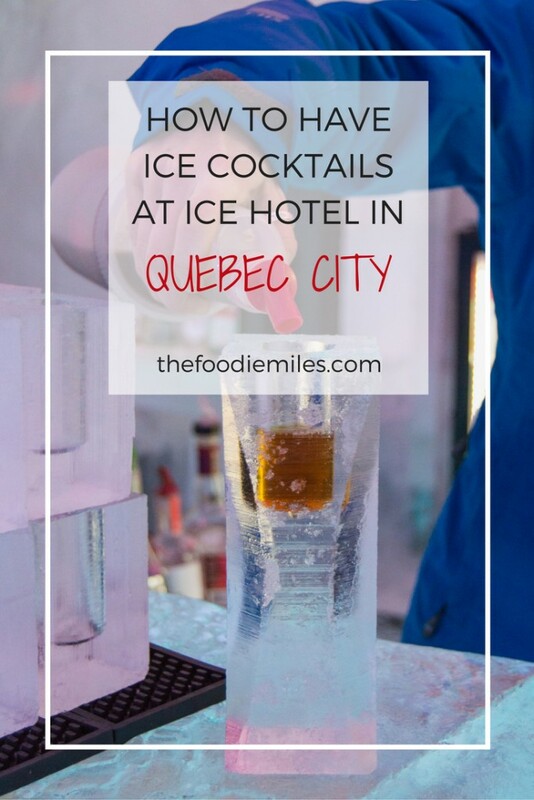 If you are traveling to Quebec in winter, make sure to read my one-day Quebec itinerary, this post with the foods you must try in the city, and these tips for visiting Quebec winter carnival.